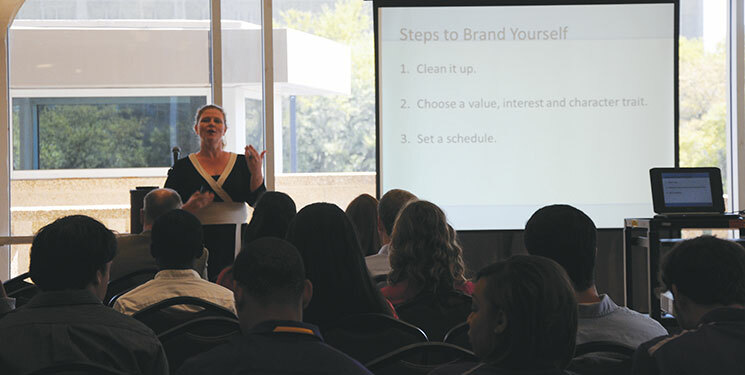 Stafford Kendall teaches Career and Leadership Seminar attendees how to market themselves for their future careers. Apple was created in a garage. Nordstrom began as a small shoe store. Wrigley started out selling soap. And the Career and Leadership Seminar was born from a casual breakfast comment with the intent of giving LSU Humanities & Social Sciences students a launchpad for career success. Steve Herbert was eating breakfast with fellow LSU100 nominees when he mentioned to Dr. Gaines Foster, former dean of the College of Humanities & Social Sciences, that HSS students make exceptional leaders because of their intrinsic communication, reasoning and critical thinking skills. It didn’t take long for the entire table to get involved, discussing how best to provide leadership and career training for these students. Herbert and his wife, Julie, both HSS alumni, quickly began working with the college to develop the seminar, funded through Steve’s company, USA Technologies. The Career and Leadership Seminar attracted more than 30 students who learned leadership skills, how to market themselves for their careers, and proper etiquette for business meals. Steve, who provided the seminar’s keynote address, joined fellow entrepreneurial HSS alumni Fred Dent, founder of Dent Asset Management, and Stafford Kendall, co-founder of Covalent Logic, as speakers. “I want students to know, ‘You can do whatever it is that you want to do,’” Steve said.